Board of Technical Education (BTER), Rajasthan is going to conduct the Rajasthan Pre-Engineering Test RPET 2014 which is scheduled to be held on 21 May, 2014. RPET 2014 is the state level entrance examination for the admission to undergraduate programme (4-Year Engineering Degree) in the disciplines of Engineering (Bachelor of Engineering B.E / Bachelor of Technology B.Tech) in the government, private and self-funded technical colleges and universities of Rajasthan other than the BITS Pilani, Jaipur (It conducts their separate entrance test) for the academic session starts from 2014-15. Board of Technical Education Rajasthan, BTER has made an arrangement for the students so that they can apply online for RPET Examination 2014 by filling the online application form and pay the application fees (if applicable) through eMitra/CSC Kiosks authorized by Rajasthan Government. The RPET 2014 Notification was released on 31 March and last date for online application form submission was 15 April, 2014. A large number of students appeared in Rajasthan Pre-Engineering Test RPET Exam every year. All those applicants who have submitted their application form successfully and paid the application fees before the last date, can download the RPET Admit Card 2014 from the link given below. It will be available online on the official website of Rajasthan Board of technical education- techedu.rajasthan.gov.in and www.rpetexam.com. We are advised to all the students, you should download your RPET Admit card as soon as possible when it is released. We will inform you when RPET Exam Admit Card would be available to download from their official website, so please visit this page regularly for any update related to your RPET Exam. RPET 2014 Examination includes mainly three subjects out of which two compulsory subjects – Mathematics and Physics while students could select any of the optional subjects (Chemistry, Computer Science, Bio-Technology and Biology). 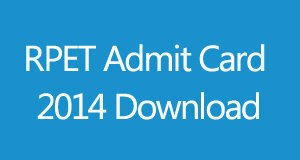 How To Download RPET Admit Card 2014? All the applicants who have applied for RPET 2014 and looking for the download link of RPET Admit Card 2014, can download your admit card from the direct link mentioned below. You must know your Application Number / Registration No. (Number generated after the successful online registration) and student’s date of birth. Enter both details and click on submit button, which gives you the details of your admit card. Download and Print it out. Take a hard copy of this RPET 2014 Admit card which will require during the entrance into examination hall. Done!